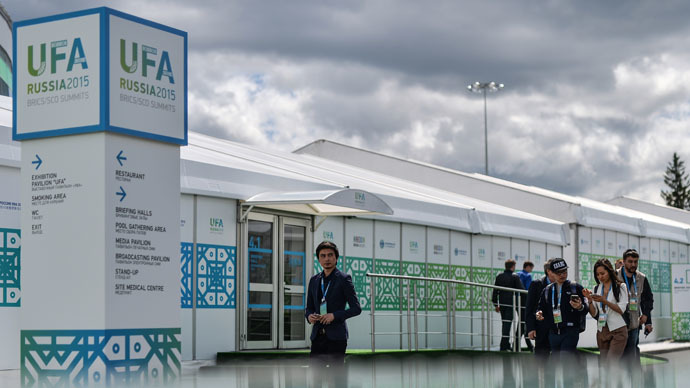 About 10,000 visitors are expected at the two events in Ufa – the BRICS and the Shanghai Cooperation Organization (SCO) summits – taking place on July 8-10. RT will keep you updated on the latest developments. Russian President Vladimir Putin has held a Q&A session with journalists, wrapped up the 3-day BRICS/SCO summits in Ufa. He repeated that Greece hasn’t asked Russia for financial help. He also expressed hope for a quick resolution of the crisis in Ukraine as well as the Iran nuclear deal.The President invited the journalists to the Eastern Economic Forum that’ll take place in Vladivostok in October. RT sums up the BRICS summit in Ufa, gives the mood of the Western media and also Dilma Rousseff’s opinion that sanctions are a dead-end. United Nations Under-Secretary-General for Political Affairs Jeffrey Feltman spoke to RT on the sidelines of the forum about the conflict in south-east Ukraine, ISIS, the immigration problems in Europe and UN role in settling world conflicts. SCO summit ended with adoption of documents aimed at expanding the six-member organization. The leaders of Russia, China, Kazakhstan, Kyrgyzstan, Tajikistan and Uzbekistan have inked the decision to launch the procedure of accession of India and Pakistan to the bloc. Belarus was granted and observer status, while Azerbaijan, Armenia, Cambodia and Nepal became dialogue partners. SCO leaders have signed the Ufa declaration and the development strategy up to 2025 and agreed to tackle terrorism, separatism and extremism. The next SCO summit will be held in September 2016 in Uzbekistan. SCO leaders have signed a document to begin the accession procedure of Pakistan into the group. Mongolia expects representatives of the SCO at the autumn session of the OSCE Parliamentary Assembly to be held in Ulan Bator, said President Tsakhiagiin Elbegdorj. SCO members are planning to issue international youth travel cards, said President Putin at the SCO summit. "I am convinced that this project will help young people develop mutual contacts," Putin said.